Parenting behaviour varies greatly across the animal kingdom. In most mammals, only mothers look after the young, and in most fishes, only fathers look after the young. When it comes to birds, mothers and fathers usually work together to build a nest, feed their chicks, keep them warm, and protect them from predators. At the opposite end of the spectrum are insects, where in most cases, the young are left to fend for themselves. An exception to this rule is burying beetles, which are the definition of model parents. In this species, parents tend to stick around until their young are old enough to leave the nest. The parental duties of these beetles include feeding and grooming the offspring, protecting them from predators, and keeping the nest clean to prevent the growth of bacteria and fungi. In about half of burying beetle families in the wild, both parents stay at the nest to look after the larvae. However, in 39% of families, the dad abandons the nest before the larvae hatch, leaving mum with the burden of raising them on her own. It is also possible for the mum to be the one who abandons the nest, but this only happens very rarely (in 3% of families). These differences between burying beetle family units led us to ask whether larvae raised by both parents have any advantage over larvae raised by only one parent. In evolutionary terms, we were looking at a long unanswered question: are two parents better than one? To test whether offspring benefit from having both mum and dad around, we set up a simple experiment in the lab. The study included three types of nests: a single male parent, a single female parent, and a pair with a male and female together. 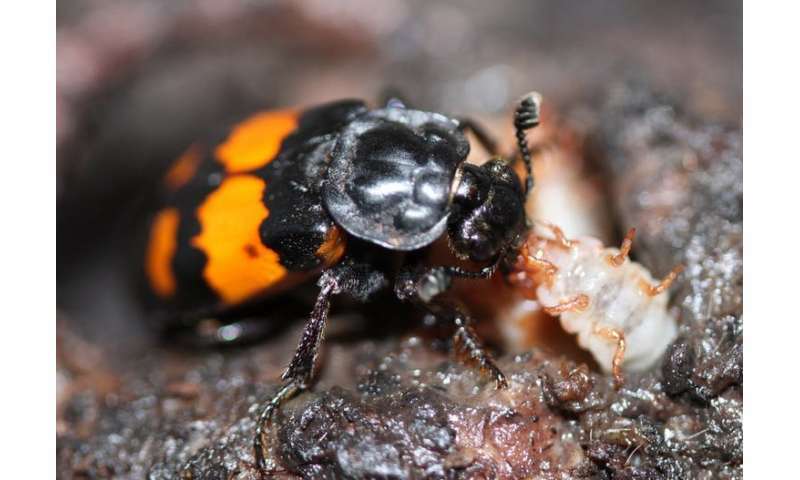 Offspring do better in two-parent families:Young burying beetles raised by two parents performed better than offspring raised by single parents. They were larger when they left the nest, and they were more likely to survive to adulthood. There was no difference in the average amount of care received per offspring in the single-parent and two-parent families, so it is still a mystery why offspring from two-parent families performed better – this is an intriguing question that needs to be investigated further. Male parents exploit their female partners:Although offspring with two parents did better in our experiment, these benefits to the offspring came with some costs to the parents – at least the females. During co-parenting, males seemed to exploit their female partners by doing less work than they did when they were on their own. Females were then forced to compensate for the males' reduced effort by taking on more of the workload. Similarly, males were more likely to abandon the family when co-parenting compared to females – 35% and 5% respectively, more or less in line with numbers in the wild. In biology, we commonly test our ideas using animals that are easy to keep and breed in the laboratory. From these studies of so-called "model organisms", we can derive principles about animal behaviour and evolutionary biology that are applicable across the animal kingdom, not just the species used in a particular experiment. Given our finding that burying beetle offspring perform better when raised by both parents, one might wonder whether it could apply in humans. Are children from single-parent families at a disadvantage compared to those from two-parent families? Before extrapolating these results to humans, it is important to remember that there are – unsurprisingly – many differences between burying beetles and humans. One key difference is that in burying beetles, it is just the parents that look after the young, whereas in humans, childcare duties are commonly shared with various "helpers", such as friends, grandparents, and other relatives. 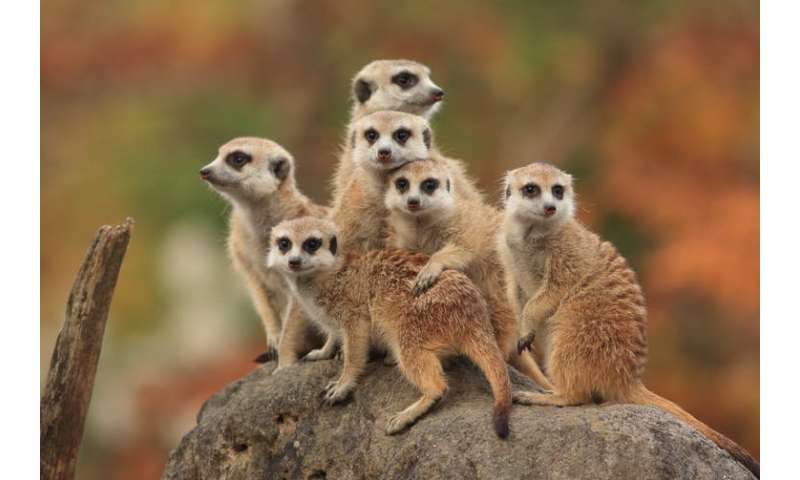 This type of family dynamic is actually not unique to humans – the presence of helpers is also seen in some non-human animals like meerkats. Without additional research, it is difficult to generalise our results to humans or even non-human animals in which offspring are looked after by anyone other than the parents. Nevertheless, our new findings are an important step towards a better understanding of why co-parenting has evolved to be so widespread in animals where offspring are dependent solely on their two parents (as is the case in most birds). The next step is to repeat this experiment in a wide range of animals to determine whether two parents are truly better than one, beyond burying beetles.